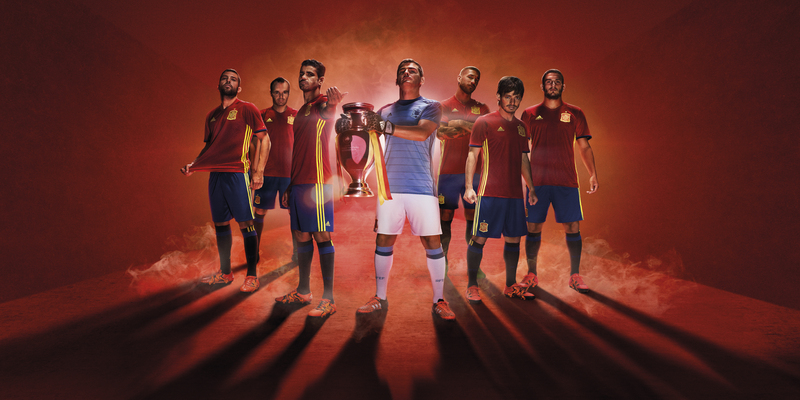 The new Adidas Spain Euro 2016 Kit will be worn by the Spanish players when they face England in the international friendly on Friday, 13th November. The Spain Euro Home kit was unveiled on 10th November at a spectacular event in Madrid, joined by the entire squad of the defending champions. The new Spain Euro Kit has a classic design – the Euro 16 Spain Home Kit combines the famous colours of La Roja’s striking colour design with two tones of red, and returning to the blue shorts and dark socks. One of the striking features of the Spain 2016 Euro Kit is the presence of the triangle, which is the key inspiration behind the making of Spain’s Euro shirts. One of the notable features of the Spain National Team in the past years it’s their triangle game; that game style that has managed to dominate world football and that will be present not only on the pitch but on the jersey. Therefore, the triangles become a decisive element in the Euro 2016 kit and make up part of its own material. The three iconic Adidas stripes are not placed on the sleeves but on the side of side of the Spain’s Euro Kit, the sleeve cuffs are blue and black and the Spanish flag is placed on the sleeve cuffs. What do you think of the new Adidas Spain Euro 2016 kit? Let us know your thoughts on twitter and facebook.